Montreal, December 20, 2016 – TickSmith’s TickVault Platform is now compatible with Thomson Reuters Tick History, providing the buy side community an in-house solution to manage this data in its entirety through one single interface. To demonstrate the platform compatibility, TickSmith has launched a demonstration portal at https://trdata.tickvault.com. 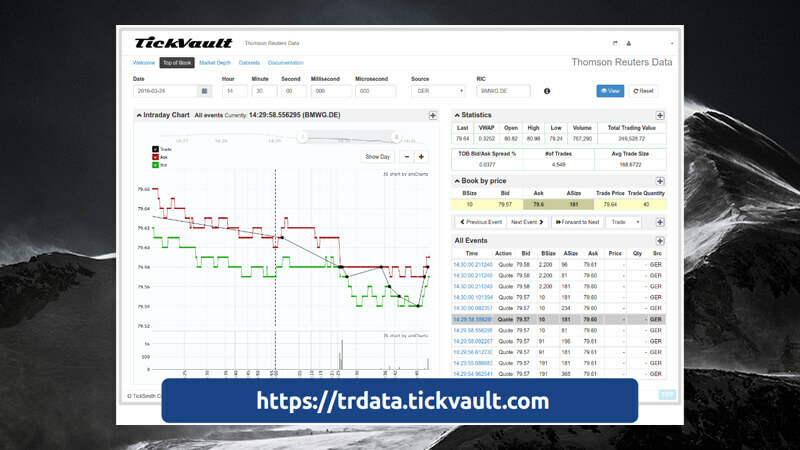 This demonstration site allows users to demo the TickVault software platform pre-loaded with a sample 3 months of Thomson Reuters Tick History from various exchanges. The site further allows users to access and visualize Thomson Reuters Time and Sales, and Market Depth data. Users can also access data using REST APIs. The Thomson Reuters Tick History provides microsecond, time-stamped tick data dating back to January 1996 and covering more than 45 million OTC and exchange-traded global instruments. This data, two petabytes in size, is recorded from the Thomson Reuters real-time feeds covering both OTC and exchange traded instruments across over 400 trading venues and third-party contributed data. The compatibility between Tick History and TickVault now allows buy side institutions to store the entire database of Tick History in-house rather than only selected portions due to data capacity issues. The demonstration portal runs on TickVault, a comprehensive platform used by trading and risk groups, regulators, exchanges and data vendors who need to accumulate, transform, analyse and disseminate huge amounts of financial data from quote feeds, trading systems, event feeds and more. With multiple specialized tools and modules, the platform provides easy access to files, data, analytics, time-series, workflow and reports via point and click interfaces and APIs. TickVault can be deployed on a firm’s Hadoop cluster and in the Cloud. TickSmith received the 2015 Innovator Award for Best New Hadoop-Based Platform for Management of Brokerage Data by the FIA, the world’s leading trade organization for the futures, options, and cleared swaps markets.